They aren't quite rocks. But I do keep certain anchors in my life that maintain my creativity and generally keep things from blowing away. These range from watching jazz concerts to windsurfing on Greek shores, and perusing museum gift shops, which is where I buy the paperweights that actually keep things from blowing away. Unusual talents include transliterating Greek to English, and naming Snapchat group threads at precisely the right moment. Please find attached a copy of my résumé for a list of my passions and achievements. For more details, please see my résumé below. I attended an online course that explores the consumer network model in marketing today in theory and practice. One of the most stimulating experiences in the course was participating in marketing simulations run by Stukent that imitate real-world marketing challenges on email, search, and social. We were asked to promote three cameras being sold by a fictional e-commerce entity, Kent’s Camera Castle via digital marketing campaigns, including search ads, email, social media, etc. 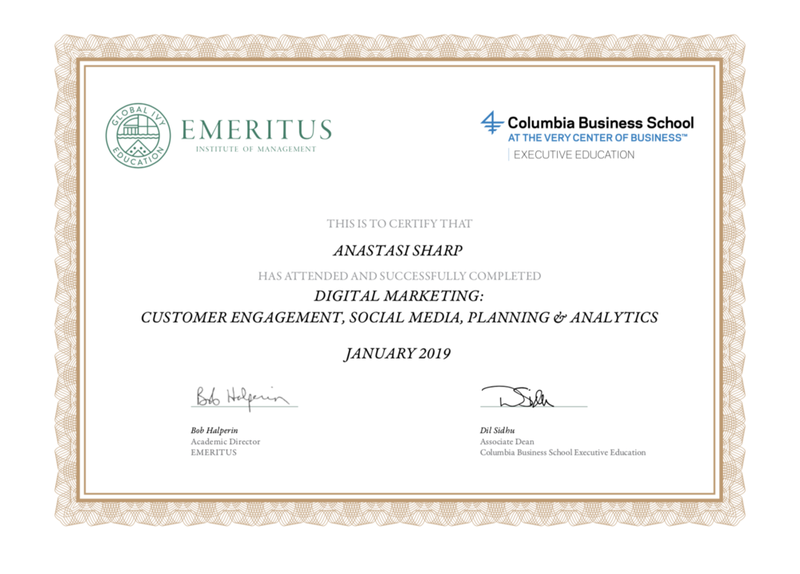 I ranked 9th out of more than 260 of classmates in the Emeritus email marketing challenge, in which we ran simulated campaigns and competed for results. The results show my performance in comparison with my classmates on key metrics such as ROI, reach, and revenue.